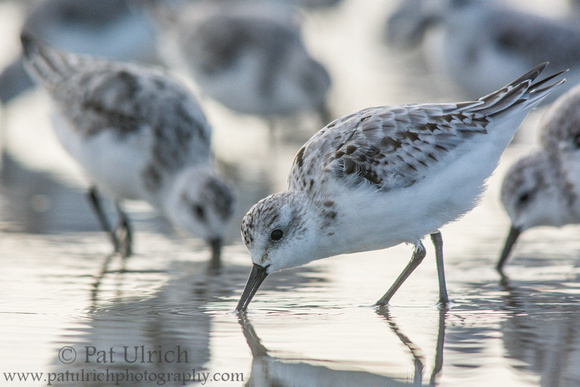 As I mentioned in my previous post, the conditions weren't ideal for photography on my fall trip to Southern Maine -- but when I find a flock of friendly sandpipers, it's worth making the most of it! As the rising tide continuously pushed the flock to different positions around me, I had to settle for some angles looking directly toward the morning sun. When this happened, I pulled my eye away from the viewfinder and just enjoyed the lively scene of this energetic flock of shorebirds. Thankfully, there were some high clouds passing through, so when one slipped in front of the sun, I'd go back to the camera and work what I could. At the time, I didn't have much faith that any of the images would turn out. This proved to be mostly true when I reviewed the images later, but this frame stood out to me with the pattern of the three feeding birds and enough details in the shadows. It's not my typical style of shorebird photography, but it's fun to take advantage of a new challenge when the opportunity presents itself.